Are the health benefits of grass fed butter worth spending the extra cash for? Is it true that grass fed butter may be the healthiest dairy product you can eat on a keto diet? Turns out, butter’s way more complex than it appears. This creamy, humble concoction can be loaded with potential health benefits — but only if you choose the right type. So let’s take a trip to the farm and find out what the term grass fed even means. Butter is made by churning the fresh cream from cow’s raw milk. The butter (or fat) naturally separates from the buttermilk during churning. To make grass fed butter, also known as pasture butter, you need dairy cows producing grass fed milk. Grass fed cows are allowed to graze on green, grassy pastures, which is the best food source for them and the one they’d prefer to eat out in the wild. Since they feed on grass, they produce grass fed milk, which creates grass fed cream, which then can be made into grass fed butter (GFB). See the difference between these two diets? What cows eat — just like what humans eat — matters a great deal. Grass contains a lot of phytonutrients, one of which is beta-carotene, a precursor of vitamin A. This is the same antioxidant you’ll also find in carrots and tomatoes. You can tell the difference between grain-fed and grass fed butter just by looking at their appearance: commercial butter is a pale yellow or white while grass fed butter has a rich, deep yellow hue. That may be one reason why grass fed butter scores higher marks in flavor and appearance than grain-fed in consumer studies[*]. But cows feasting on fresh green grass also improve the nutritional properties found in regular ol’ butter too[*]. Organic butter: “Organic” is not the same as “grass fed”. While organic butter is free of pesticides, it’s not necessarily grass fed. So if you want true grass fed butter packed with nutrients, an organic butter won’t cut it. Irish butter: Irish butter is a European-style butter that comes directly from Ireland. It’s made from grass fed cow’s milk and has a higher fat content than regular butter, which gives it a richer texture. Most of the time, Irish butter is grass fed butter. Grass fed butter may be one of the healthiest dairy products on a ketogenic diet menu. Butter is basically pure fat; it has zero carbs, zero sugars and zero grams of protein. As you can see, most of butters’ fat is saturated. If you’re on a ketogenic diet, you probably already know that saturated fat is healthy. Even though saturated fat used to be blamed for contributing to heart disease, scientists have now debunked that myth[*][*]. Believing in the saturated fat myth, or that sat fat is bad, is like being scared of monsters under your bed. It’s not real. Turns out, sugar and trans fat were the ones causing high cholesterol, high blood pressure and heart disease all along, not fat[*][*]. Saturated fat from healthy sources like grass fed butter and coconut oil is beneficial for your health. In fact, the milk fat used to make butter is the most complex of all natural fats, since it’s over 80% pure fat and contains 400 different fatty acids[*]. One of those fatty acids is pretty famous as we’ll discuss next. Grass fed butter has higher concentrations of omega-3 fatty acids than grain-fed butter[*]. Omega-3 fatty acids — a type of polyunsaturated fat — are essential for your body, but you can’t produce them on your own, so you must get them from your diet. Grass fed butter also contains more CLA — a type of healthy omega-6 fatty acid — than butter made from grain-fed cows. Cows allowed to graze in pastures can have 500% more CLA in their milk than their grain-fed sisters[*]. So what is conjugated linoleic acid anyway? Certain companies are even using CLA as a diet pill to help you lose weight[*]. To keep this fatty acid train rolling, grass fed butter also contains butyrate. Butyrate is readily available in grass fed butter. This SCFA doesn’t need any digestive enzymes or bile production to work so it’s super easy to absorb and fast to use. Our last nutrient hidden in grass fed butter may be one you’re definitely not expecting: vitamins. You don’t normally associate vitamins and antioxidants with butter, but the vitamins and antioxidants present in the nutrient-rich grass cows eat get passed on to you. You know, so you don’t have to eat grass yourself. As you can see, grass fed butter trumps grain-fed butter any day of the week. Next, we’ll talk about how all these vital components of grass fed butter work for your health. We hear a lot about why we should lower inflammation, but what does that really mean? Inflammation is your body’s natural defense mechanism when it feels an attack. Without acute inflammation, which sends white blood cells to combat foreign enemies, you’d get fatal infections from simple papercuts. But chronic inflammation occurs when your body remains on high alert all the time. Scientists think inflammation may start with your gut health. While certain fats and oils — like trans fats and canola oil— increase inflammation, grass-fed butter does the opposite. Inside every tablespoon of grass-fed butter you’ll find butyrate, a known inflammation reducer[*]. And one of the best places butyrate shines is way down in your gut. Butyrate also helps to keep your ticker healthy. Inflammation in your artery walls can cause plaque buildup, which raises your blood pressure. Then, if part of that buildup breaks off and forms a clot, it will block blood flow and lead to a heart attack or stroke[*]. Since grass fed butter is anti-inflammatory thanks to its high butyrate content, it can help prevent this. Your gut is the most common spot where system-wide inflammation begins. When you have an inflammatory bowel disease or leaky gut syndrome, undigested food particles have the ability to leach out of your digestive tract and into your bloodstream. Since these particles shouldn’t be there, you experience inflammation as a response to the foreign invaders. A deficiency in butyrate may contribute these digestive conditions. See, butyrate patches up the holes in your digestive tract, so increasing butyrate has been shown to stop inflammation and provide relief for leaky gut symptoms[*]. And thanks to its anti-inflammatory effects, continued butyrate intake may lead to improvement and even remission for those suffering from Crohn’s disease[*]. It’s also shown to reduce the symptoms of ulcerative colitis[*]. Speaking of inflammation, medical professionals also think chronic inflammation is to blame for heart disease[*]. Heart disease is the leading cause of death around the world. As we touched on earlier, health professionals back in the day believed saturated fats from butter and animals contributed to high cholesterol and eventually heart disease. But as more people stopped eating butter, bacon, and eggs, heart disease and obesity rates went through the roof. What gives? While grains and sugar are the real culprits of this American epidemic, fat can help reverse it. Evidence shows people who add more grass fed dairy to their diets have lower risks of heart disease. Cows in Australia are grass fed. A 16-year study there showed citizens eating the most high-fat dairy products had a 69% lower chance of dying from heart disease than those who didn’t eat them[*]. New Zealand also has its own famous brand of grass fed butter called Anchor butter. Even though it’s not certified USDA organic, it’s made with free range, grass fed cows. Costa Rica also believes in grass feeding their cows. A study there compared the fatty tissue of close to 2,000 patients who had heart attacks and lived with another group of 2,000 people who did not have heart attacks but had similar health markers. Researchers noticed higher CLA levels (a good indicator of a diet full of high-fat dairy products) in participants without heart attacks[*]. So, increased CLA consumption may lead to lower risks of heart attacks. Good thing grass fed butter has 500% more CLA than grain-fed butter, right? Plus, as a high-fat dairy product, grass fed butter is one of the best sources of vitamin K2. Vitamin K2 has been studied for its ability to ward off atherosclerosis (aka plaque build up) and heart attacks[*]. In the now famous Rotterdam Study, participants with the highest intake of vitamin K2 in their diets had 57% lower risks of dying from heart disease and a 26% lower chance of dying from all other causes[*]. Researchers from another trial learned that every 10 micrograms of vitamin K2 women have per day lowers their risk of heart disease by 9%[*]. Vitamin K also plays a major role in protecting your calcium stores. Did you know there are actually two important forms of vitamin K? Vitamin K1 is found in plants like leafy greens and is essential for blood clotting. Vitamin K2 is found in animal products and may be able to reduce both osteoporosis and heart disease. Wondering how heart disease and osteoporosis are related? Calcium is supposed to stay in your bones, but it can leach out of there and buildup inside your arteries. However, meeting your vitamin K2 requirement may prevent this. See, vitamin K2 slightly changes proteins so they can bind to calcium ions more strongly. This means vitamin K2 may keep calcium in your bones and out of your bloodstream to prevent both heart disease and osteoporosis[*]. Plus, vitamin K2 is super important for calcium metabolism. When you don’t have enough K2 in your system, calcium has a tendency to drop off in random deposits throughout your body. These calcium deposits can become painful kidney stones and gallstones. They also increase your chances of osteoporosis and osteoarthritis. Vitamin K2 becomes a magnet to attract all these calcium deposits and put them back where they belong (in your bones). Grain-fed cows don’t have access to this type of nutrient. This is bad news for you as calcium metabolism gone awry may lead to the development of cancer. While certain vegetables oils may contribute to the development of cancer, other oils such as olive and avocado, may protect your cells from mutating. Butter is in the category with the good guys. One study showed milk from grass fed cows had positive effects on the metabolism of rats when it came to cholesterol levels, inflammation and cell damage — all precursors to cancer cell growth[*]. That may be thanks to butyrate (again), which has been studied for its positive role in colon cancer prevention[*]. CLA, which you know by now is crazy high in grass fed butter, also has a few cancer-fighting properties up its sleeve. Studies show adding just 0.5% of CLA to your diet can reduce the growth of tumors by over 50%[*]. And remember good ol’ vitamin K2? It’s been known to induce cell death in cancerous cells[*]. While these are all perks of eating grass fed butter in the long-term, let’s talk about what it can do in the short term too. Butter has both short- and medium-chain triglycerides (MCTs). If you’re unfamiliar with all the science-backed research on MCTs, this type of fat doesn’t need to be converted by your body, so your cells can use it quickly. Both your muscles and your brain can use MCTs immediately for energy. This is why so many keto-ers love adding grass fed butter, MCT oil powder, or pure MCT oil to their keto bulletproof coffee every morning. MCTs can even be used to suppress your appetite, as we’ll see next. When you switch from burning carbs to burning fat, you’ll be part of the many who realize fat keeps them feeling fuller and more satiated than a low-fat diet full of carbs. On the flip side, high-fat diets have been associated with lower obesity rates[*]. There’s even a hypothesis that a lack of CLA from high-fat dairy sources like grass fed butter may be one of the reasons why everyone’s getting chunkier[*]. All the CLA found in grass fed butter not only ramps up your metabolism, it also lends your body a hand in breaking down your excess fat reserves. In one study of overweight and obese volunteers, participants were split into groups taking a placebo or a CLA supplement for 12 weeks. Researchers noticed the group taking the CLA reduced their body fat mass significantly[*]. CLA may even play a part in blood sugar control. CLA may improve insulin sensitivity, which means your body becomes more capable of stabilizing your blood sugar levels. During one study, participants noticed a “significant effect” on weight loss, insulin and blood glucose levels when they added CLA to their diets for at least eight weeks[*]. Research shows CLA may be so effective at improving your insulin sensitivity it has the same results as synthetic diabetes drugs without any of the bad side effects[*]. That’s news to put a spring in your step, which is exactly what our last health benefit of grass fed butter does too. Grass fed butter has more vitamin A per tablespoon than regular butter from grain-fed cows. True vitamin A, also known as retinol, is only found in large quantities in animal products like grass fed dairy, organ meat and free range egg yolks. Combine retinol found in grass fed butter with collagen protein powder, which improves your hair, skin and nails, and you’ll be inspiring envy like a true Insta star in no time. So are you finally ready to score all nine of these amazing health benefits of grass fed butter? Before diving into how to get more grass fed butter in your diet, let’s tackle the greasy elephant in the room: How does grass fed butter compare to margarine? Marketing companies have tried their hardest to convince people butter is evil and margarine is a healthier fat source. Margarine is made with partially hydrogenated vegetable oils like corn, soy and canola. Way back in the early 1900s, scientists figured out a way to add hydrogen atoms to these oil molecules to make them solid at room temperature. This partially hydrogenated oil was cheaper than butter but had the same uses. Now studies demonstrate margarine greatly increases your risk of heart disease while real butter intake actually reduces it[*]. You can find grass fed butter almost anywhere nowadays, at the grocery store, health food store, farmer’s market, and of course, Amazon. We recommend Kerrygold butter, a brand of pure Irish grass fed butter we use in our own keto recipes. You can find it salted or unsalted. On keto, eating more salt may actually be necessary to keep your sodium levels balanced, so don’t be afraid of going for salted butter. Alternatively, you can pick unsalted butter and add sea salt yourself. Butter is a solid fat at room temperature and melts to a golden liquid when heated. The milk solids in grass fed butter can burn quickly so you’ll want to cook or bake with it at temperatures lower than 350 degrees F.
You’ll find both unsalted and salted grass fed varieties at the store to both highlight the sweet nature of cream in desserts and enhance the richness of savory dishes, respectively. What If You Can’t Do Dairy? Since butter is technically a dairy product, certain people may not be able to process it easily. However, since butter does not contain any lactose and just a bit of casein, those with a lactose intolerance should be able to handle grass fed butter without a problem. If you do experience digestive discomfort, you can always try Ghee butter instead. Ghee is clarified butter made by cooking the casein from the milk solids out of grass fed butter to leave just the golden fat behind. Ghee also has a higher smoke point, since the milk proteins — which normally burn at higher temperatures — are removed. So it’s better for higher heat cooking than regular grass fed butter. No matter which way you choose to add more grass fed butter to your diet, you’ll be helping your body keep inflammation low, prevent leaky gut, reduce your cancer risk, control your blood sugar, and much more. It may take you a minute to wrap your head around butter being a health food, but when you do, those health benefits will taste soooo good. 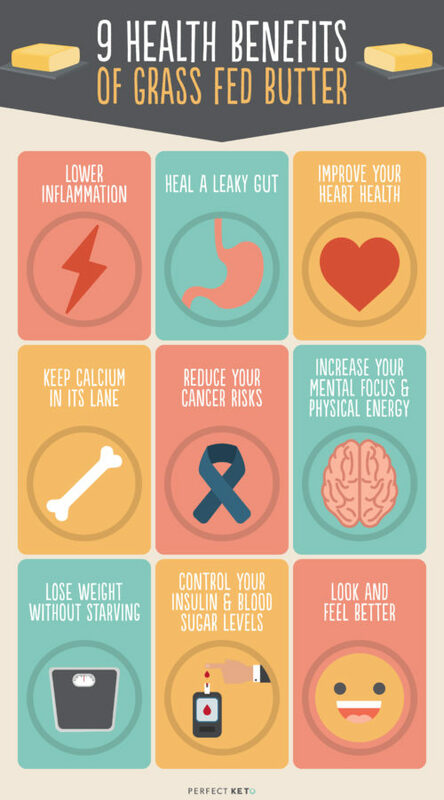 I loved this information as a diabetic I’m always looking for healthy tips like this. Thank you.